Started our journey from Lokmanya Tilak Terminus & reached Nashik at 4.00AM. From Railway station we went to CBS-Nasik. ST bus to Satana (सटाना) ply from CBS-Nasik and not from the ST bus stand outside the Nasik Railway station. 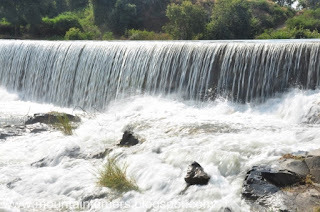 So the journey- Nashik to Satana, Satana to Taharabad (ताहराबाद) and Taharabad to Salherwadi (साल्हेरवाडी). Salher is the highest fort in Sahyadri Mountains (1567 Mtr.) 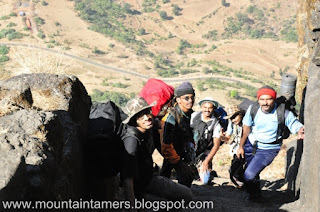 & second highest place in Maharashtra, after Kalsubai. There are two approach routes for this fort. One via Salherwadi & other from Waghambe. 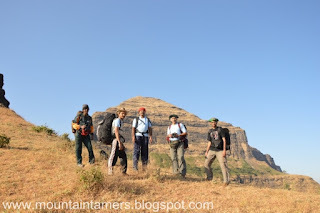 We had planned our ascend from Salherwadi (साल्हेरवाडी) route and descend to Waghambe (वाघाम्बे ). The trek route from Salherwadi starts from here (Ref. the photo below). It takes 1.5 to 2 hrs to reach top. This route is all filled up with historic remains of the fort. A Bulwark, adjacent to the third entrance (महा दरवाजा ) signifies the pulchritude of the past. You will find many carvings, scripts engraved on the Fort walls. From this place (This photo below), we reached first plateau in 1/2 hr. Fort remnants like small buildings, temple, sculpture, cisterns are all spread out here in quite a few numbers. 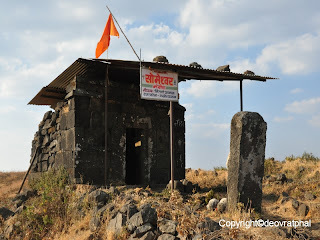 Tomb of Suryaji Kakde, is an existing sign of the fierce battle fought between Marathas and Moguls. The Marathas were victorious, but lost a prominent warrior along with 10,000 other soldiers. (Scroll down till the end to read about the Battle of Salher). A after 2/3 precipitous stairway climbs, comes another plateau which houses a Havan Kund (यज्ञ कुण्ड), some broken sculpture remains (of dunno what !! ) and many more water cisterns. From here we can see two caves, which is the only shelter above, up here, which can accommodate about 50 people at a time. And in its front, lies an open temple of Renuka Devi (रेणुका देवी ), a temple of Ganesha (गणेश ) & an outstretched lake Gangasagar (गंगासागर ) and still more baby ponds सूर्याजी टाके, गणेश टाके इत्यादि (So you must have realized that water is not a problem here). It was 12.30 PM, and after having our lunch, we left for Salota. We kept our back-packs in one of the caves, and started for the 2nd destination. The route to Salota is fairly tough but manageable. The route is full of scree & at some places huge boulders have blocked the entrance. There is plenty of water available (from cisterns) and also the caves along the route can still be used for overnight stay. The top of Salota offers magnificent view of Salher fort. While returning to our shelter (the caves), we enjoyed the sunset from the Parshuram (पर्शुराम) temple, the highest point of Salher Fort. Renuka devi is the mother of lord Parshuram. The Parshuram temple lies at the highest point of the fort. We got down to Waghambe (the other side of the fort) to catch a bus to Mulher (मुल्हेर) village. Do not expect much from Waghambe village. There are very few stalls open in the morning and even if open, they will have only bread and tea. We had some bread-tea at a stall (चहा ची टपरी) near the place where ST bus halts. We had reached in-time to catch the bus to Mulher. Mulher village is comparatively big and has many hotels, stores etc. After refilling the food-stock & downing a cup of tea, we again started off. We trod all the way from Mulher village to the base of the fort. Its a tar road with very less tree cover. 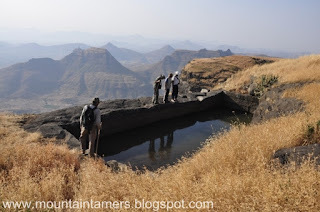 Our first destination was Hargad (हर्गड़ ) fort, and then stay at Mulher Fort. Finding the way to Hargad Fort was too much of tiring & time consuming. The reason being, the fort is hardly visited by trekkers, as there is no water supply nor shelter at the top (there is water at the top, but it is not fit for drinking). And the dense tree line at the base, makes it impossible to trace the proper route. The actual route follows all the way through the forested cover up to the gully (V- gap), between the valley (Ref. see the photo below). Only standing structure at the top is the Someshvar (सोमेश्वर) temple. Two cannons, ruins of building, palace remains is all worth watching there. 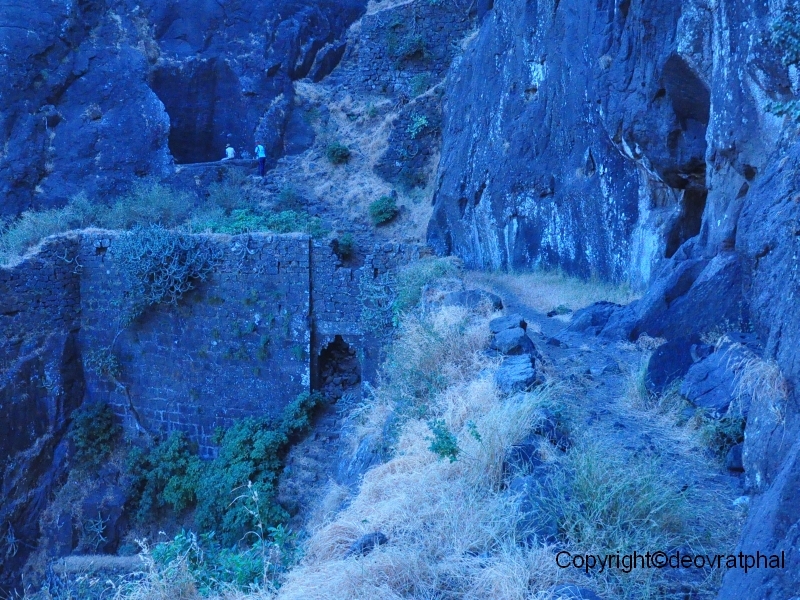 Having explored the fort, we left for Mulher Fort, as the cave there were our shelter for tonight. 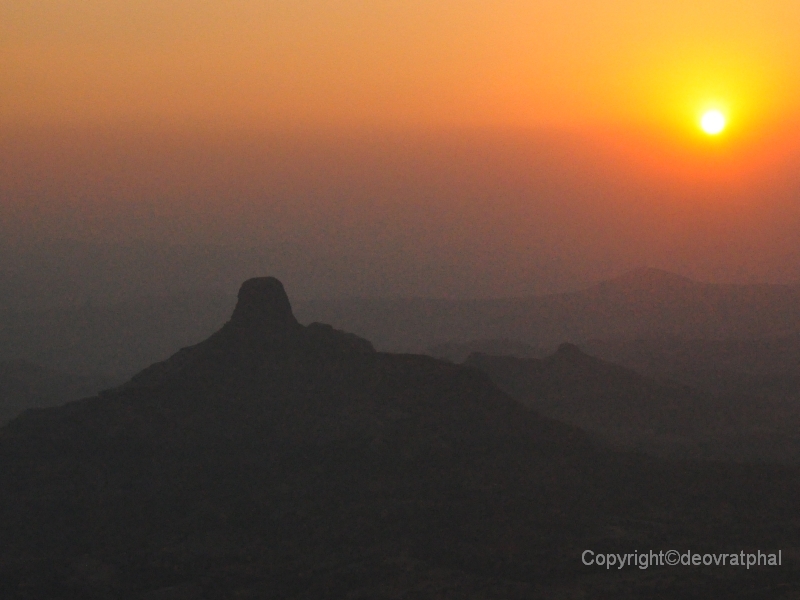 If you have a good binocular with you you can try to spot an old canon on Hargad from Mulher top (you sholud be on Mulher top, facing Hargad) . 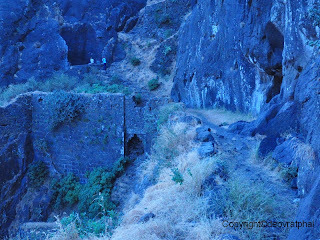 It was 6.30 PM when we reached the cave at Mulher Fort, so the chances of visiting Mora fort the same day was ruled out. So we stepped out the next morning to explore Mulher Fort and Mora Fort. Mulher & Mora Forts are connected by a small ridge. The Entrance of Mora reminds me of castle Greyskull from He-Man. After visiting Mora, we cleaned the cave that we stayed in and after dumping the bio-degradables and packing the plastic-paper waste with us, we traced back the steps to Mulher Village. We had our breakfast/lunch at Mulher village and inquired about transport to Pataalwadi, the village at the base of Nhavi fort. Mulher village is fairly big and photogenic with old houses and wooden windows with intricate carvings on them. I would strongly recommend you to visit them. We requested an Autodriver to take us to the base village of Nhavi fort. On the way, we halted near the water source to take bath (after 2 days). I must say, the driver was kind enough to wait for us till we got freshened-up. A lake has been created to harvest the water from rain and use it during the extreme summers. The comparatively tough fort, the route is almost dead, and it appears that no one has visited this fort since a decade. The route starts from the left ridge (see pic below) and ascends from the other side of fort (opposite side of lake). The route till top requires climbing a verticle rock and walking on a narrow stretch of exposed path. You will encounter a series of water tanks on the route. The route after the tanks is exposed and care needs to be taken while climbing. You will be most probably welcomed by the monkeys on the top. Reaching the top was truly a blissful feeling. The last duet of our adventure. The route is full of stairs, from start to end, so not much of fun, but the top offers marvellous view of the surrounding region. Mostly visited by Jain's (जैन) as the caves at the top is home to several sculpture's of Digambar Jain (दिगंबर). It is home to famous temples of Adinath and Parshwanath. We stayed in a Jain Aashram (आश्रम) at Bhilwad village. The food is much better; "best" as compared to what is available in the village at the same price. There is also a The accommodation is free of charge, but they expect you to pay a small price (100₹ to 900₹) as a donation to their trust. Transport is available, right to the starting point of the foot of the Mountains, at economical rates (to-fro). At the end of the adventure we were offered masala-tea as part of prasad from the ashram. Trek was enjoyable. 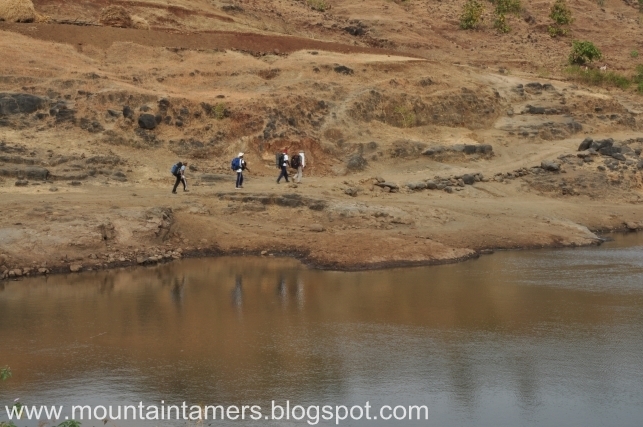 Right from Salher, Salota, Hargad, Mulher, Mora, Nhavi, Mangi, Tungi, each one had something unique to offer for trekker. You can enjoy this full circuit if you have 4 to 5 days in-hand and have planned accordingly. Take a good binocular with you if possible. It would be great to see the close-ups of one fort, while you are sitting on the top of other fort. The fort of Salher was captured by Shivaji in 1671, during his campaign of the Baglan region. This news reached the Mogul emperor in Delhi. He got incensed with this news and said "I have sent lakhs of cavalry but they have come back shamefully, now whom do I send?" The emperor then decided "As long as Shivaji is alive, we are not leaving Delhi". He then called Ikhlaas Khan and Bahlol Khan and sent them with a cavalry of 20,000 horses to attack Salher. Ikhlaas Khan then laid siege of Salher Fort. When this news reached the Maharaj, he sent message to his Commander in Chief Prataprao through his secret agents "Go to Salher with your troops and drive off Bahlol Khan". He also sent a parallel letter to Moropant Peshwa to go from Varghati Konkan along with his troops and meet Prataprao near Salher. As planned, both Prataprao and Moropant rode to Salher from both sides and a fierce battle ensued. Writings of Sabhasad Bakhar describes it as follows: "There was a fierce battle throughout the day and night, Mughals, Pathans, and Rajput, Cannons, Elephants, Horses and Camel troops fought alongside each other. The battle was so fierce that the dust which was raised by the troops rose up in an area of 3 km and the troops could not recognize who was fighting on which side. The Elephant troops arrived and both sides saw 10,000 troops perish and blood flow like rivers". The Marathas defeated Ikhlaas Khan and Bahlol Khan in this bloody battle, which saw tremendous destruction all over. There were 1,20,000 troops of Raja Shivaji and it returned 10,000 less, lost in battle. Shivaji’s troops captured 6,000 horses, 6,000 camels, 150 elephants, heavy gold ornaments, gold coins and expensive cloth from the enemy troops. The maratha soldiers showed extreme courage during this battle. Moropant Peshwa and Prataprao Sarnaubat exchanged pleasantries. Suryarao Kakde became a martyr during this battle. He fell after being hit by a cannonball. He was no mere soldier. A soldier who was as brave as "Karna of the Mahabharata" lay dead on the battlefield. Of all the face to face battles between the Mughals and Shivaji’s troops, the battle of Salher takes first place. Such a big battle was not won before. The bravery and strategy used by the Maratha troops in the battle spread far and wide and increased Shivaji’s fame much higher. After winning Salher, the Marathas also captured Mulher and established their reign over the Baglan region. This battle is looked as a mile stone in esablishing Maratha Empire. After the battle Shivaji became a nightmare for the Shah of Surat. Note: The cost 900 ₹ included healthy Breakfast, Lunch, Dinner everyday, including Kande Pohe, Pulao, Parathe, Sri Khand, Puraan Poli, Sandwich, Tea, Soup, Farsan, Laadoo, Chocolates etc. And yes, Maggi Noodles for 1 dinner. It also included the whole transportation needed for all 8 forts. Its funny how the private groups charge 2800 ₹ for just half of this treks and without exploring the fort fully. If you are on your own, you can camp on top of these forts and can also explore the forts at your own pace. To be frank, you can yourself plan this trek with proper guidance and the cost for exploring all the forts will cost less than 900 ₹ These forts are worth exploring. These forts have rich history to cherish. Photo Credits: Arjun Patil, Sunil Kamble and the rest belongs to me!